"Waynick is quick to point out that Waterway Palms Plantation is just a short run from the airport, making it easy for friends and relatives to visit and see the sights - which, by the way, begin in your backyard." Debuting on many "best of" lists, the new Myrtle Beach is a match made in heaven for many. 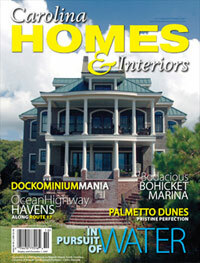 In particular, the Grand Strand - an area that spans 60 miles of coastline - is attracting a ton of attention. According to the Myrtle Beach Area Convention and Visitors Bureau, in 2003 the Travel Channel deemed the Grand Strand one of the top beaches in America, exclaiming, "Myrtle Beach is the East Coast's ultimate vacation hub." An online poll conducted by Yahoo! Travel and National Geographic Traveler magazine asked 2,200 people to rank the top 10 beaches, based on cleanliness, scenery, climate, water temperature and romance (in that order). When the votes where tallied, Myrtle Beach came in number two, beating out other hot spots such as St. Thomas. "The walks and porches here give a sense of being able to take a leisurely stroll and not just wave to your neighbors but get to talk to your neighbors and really get to know them on a personal basis," Dennis Waynick of Integrity Custom Homes explained. "Waterway Palms Plantation turns back the clock," Jade Thomas, owner of Realty Executives, said. "It places you in another decade, maybe even another century, to an almost Mayberry feel. You will find Charleston at your fingertips, right on the dramatic Intracoastal Waterway." Waynick is quick to point out that Waterway Palms Plantation is just a short run from the airport, making it easy for friends and relatives to visit and see the sights - which, by the way, begin in your backyard.